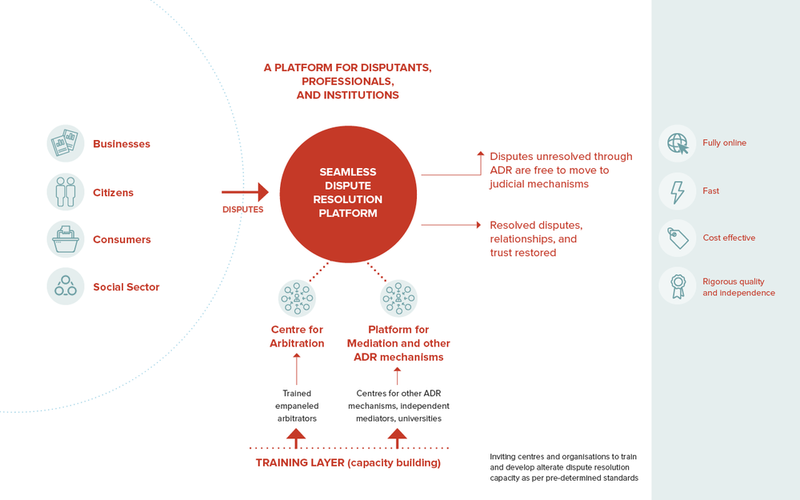 To develop a technology-driven institution that will enable large volumes of disputes to be resolved online through arbitration and other mechanisms of alternate dispute resolution, including mediation and conciliation. Disputes are a healthy and essential aspect of a functioning democracy and market, but our current platforms of dispute resolution, most notably the courts, are not able to serve our needs due to huge pendency of cases. Issues of pendency, the cost of arbitration, and misconceptions around mediation are derailing both business and society. Even as we work to unclog the courts, we need large-scale, expedient, cost-effective, and trusted mechanisms of alternate dispute resolution. 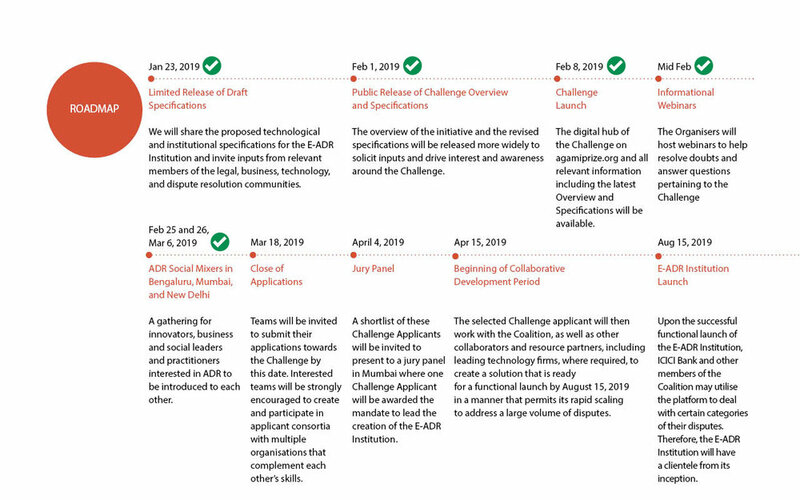 The E-Alternate Dispute Resolution Challenge 2019 invited innovators, practitioners, and social and business leaders to constitute teams and propose comprehensive solutions for the creation of such an E-ADR Institution. Applicants were asked to respond to the below-linked set of Specifications in their submissions. On April 4, a remarkable group of Jury members met at the Trilegal offices in Mumbai to interact with the three finalists and take the hard call about who they would consider best suited to lead the development of the E-ADR Institution. At the end of a long day of deliberations they chose ODRWays. ODRWays is now leading the efforts to develop and launch the E-ADR Institution in collaboration with the collaborators. A more detailed article on the Jury meeting is here. Meanwhile, if you are interested in the Challenge and wish to receive email updates please complete the brief 'Keep Me Informed’ form. ICICI Bank as the Conceptualist and Challenge Partner will be one of the first users of this institution and intends to utilize the E-ADR Institution for dealing with disputes arising in its products and services that are offered online and will consider extending the platform to its retail liabilities and retail assets businesses, which would supplement the other dispute resolution mechanisms available to the customers of ICICI Bank. Further, ICICI Bank has also agreed to provide suitable incentive at the inception stage of the E-ADR Institution established by the successful Challenge Participant, by prepaying the institutional fee (adjustable in future) for a given number of matters that it would refer to the E-ADR Institution over a period of time, thereby making available to the E-ADR Institution, suitable sums of money in advance for utilisation towards the E-ADR Institution realising its objectives. Learn more about the nature and quantum of this prepayment. * Please do note that the financial incentives do not take the nature of prize money or any equity stake in the E-ADR Institution, as ICICI Bank intends to be a user of the E-ADR Institution that meets the specifications of the challenge. Our gratitude to 25 leading practitioners in ADR, business, and law, who gave their inputs on the design of this initiative, in particular the legal framework that serves as the basis for it.